The Westside is the heart of the local surf culture and the wellspring of the distinctive Santa Cruz vibe. The typical neighborhood mix on the Westside consists of native Santa Cruzans, transplants that have become locals and, during the school year, students from UC Santa Cruz. The Westside boasts some of the most beautiful beaches and coastal views in all of Santa Cruz. Rich in surfing history, the Westside is home to Steamer Lane, a world class surf spot, as well as the Santa Cruz Surf Museum at Lighthouse Point. West Cliff Drive, the scenic route that travels along the coast, has a two mile walking and biking path that stretches from the Santa Cruz Wharf to Natural Bridges State Park. In the 1850s, the area that is now UC Santa Cruz was owned by the Cowell Lime Works, the largest manufacturer of limestone in California, which supplied much of the limestone for San Francisco after the population boom caused by the California Gold Rush. UC Santa Cruz was opened in 1965 and has since spearheaded efforts to restore and preserve the kilns and living quarters that remain from the Cowell Lime Works. The Westside wouldn’t be what it is without the counterculture influence of surfing. During the 1960s, Santa Cruz became a popular surfing destination, as well as a home for innovation within the sport. The modern wet suit was developed by surf icon Jack O’Neill during trial runs at Steamer Lane and O’Neill’s son Pat is credited with popularizing the modern surf leash at the local surf spot. The Westside is an outdoor enthusiast’s dream. With numerous parks and natural preserves in the area, as well as UC Santa Cruz and the Henry Cowell Redwood State Park, it is a paradise for hikers, dog owners and mountain bikers alike. The Pogonip Preserve behind UCSC has miles of hiking and multi-use trails and Wilder Ranch State Park is a popular mountain biking destination. Besides mountain biking and hiking, there are a handful of tennis courts, parks and basketball courts on the Westside. Derby Park, which sits behind Pacific Collegiate School, has the only skatepark on the Westside. While not an official course, the park also maintains four disc golf baskets spread throughout the open space. 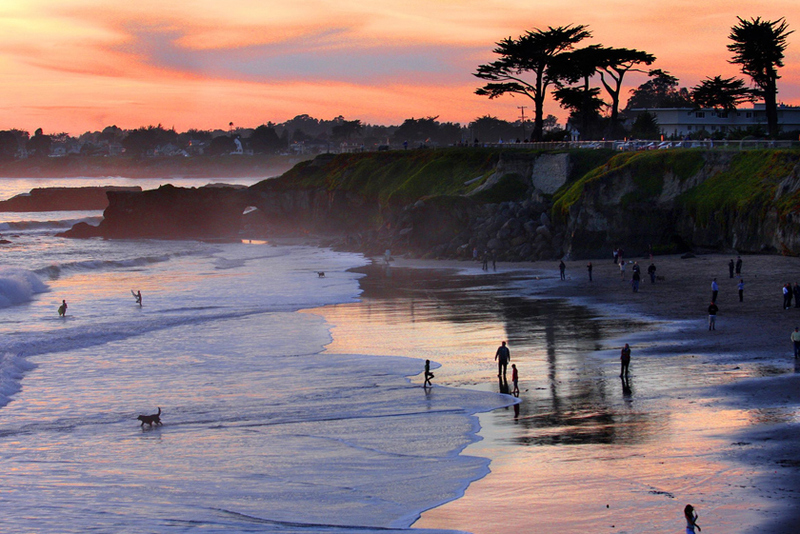 The Westside has some of the best beaches in Santa Cruz. Steamer Lane, one of the premier surfing spots in town, hosts the annual O'Neill Coldwater Classic, which draws top surfers from all over the world. Further up the path along West Cliff Dr., there are several tiny coves that offer a more private experience for beach-goers. Taking the path to the end ofWest Cliff Dr. will land you at Natural Bridges. Further up Highway 1 is 4 Mile Beach, which is appropriately 4 miles north of town. The locals are very protective of their beaches on the Westside and there is a zero tolerance policy toward littering, which should not be taken lightly. Though there’s not much shopping to speak of, the Westside does offer some local treasures when it comes to dining. True to the local-loving nature of the Westside, two of the best places to eat are virtually next to each other. Cafe Brasil offers great breakfast cuisine with a South American twist that stays true to its name. It is the most popular breakfast place on the Westside, combining terrific food and the cozy charm of an old house that’s been converted into an eatery. The restaurant gets very busy on the weekends and doesn’t take reservations so a short wait is to be expected. Get an Acai smoothie after the wait and it’s easy to convince yourself it was worth it. Just across the street from Cafe Brasil is Vasili’s, an authentic Greek restaurant with a charming ambiance that reflects the Mediterranean influence of the dishes. Their deliciously flavored souvlaki plates will make your mouth water. The Westside has two main elementary schools, Bay View and Westlake, as well as Mission Hill Middle School, Santa Cruz High School and UC Santa Cruz. Pacific Collegiate School, a high school college prep school on the Westside is the highest rated public high school in California and routinely ranks in the top 10 nationwide with 80 percent of the students going on to four year colleges. PCS was formerly Natural Bridges Elementary School, which will take over the location again in 2015. The homes on the Westside are some of the nicest you will find in Santa Cruz proper. Unlike the Victorians of downtown, Westside homes have a more modern style to them. Many of the homes near the beaches and on the upper Westside have decks, lookouts and solar panels to take advantage of the sun-drenched views.